The Local Government Unit of President Carlos P. Garcia would like to acquire copies of the Bohol Tourism Development Plans to guide us in our quest to maximize the potentials of our island town as well as to activate economic drivers which remains idol until recently. We have just uploaded the Tourism Master Plan to the website and is now accessible under Plans & Reports > Development Plans > Tourism Master Plan menu. You may also click on the link below to go directly to download page. We hope this would be of great help to your constituents, municipality and the Boholano people. IN POWERPLANTS AND FACTORIES WITH NEED SO MUCH FUELS TO USE.. This Used Hydrogen GAS Generated FUELS is no cost at all to get & generated this fuels. –	Only Small Capital to made this generating hydrogen by Electrolyses. o	A Small Piston Turbine Engines + Used Also Hydrogen Gas Fuels Small only percentage – That Also comes from Hydrogen Electrolyses Machines. o	A small Electric Generator – that connects to Piston Engines. o	Electrolyses Machines. High Powered Electrolyses (Used 220 volts Only or + Up more High Powered) That used 220 volts can generated as many + high speed to make Hydrogen Fuels in Volumes and Small Time – Means high Speed to make hydrogen gas fuels by Electrolyses machines. •	Closed Metal Container of Salt Water as Big as if need more salt Water to make hydrogen gas fuels. •	Container up also have Up space to trap and extract the hydrogen & oxygen with pressures to put them all directly to Used in Power Plants Engines, in Boiler Chamber, also used in machines that needs to generate heats and other uses. o	As many as you wants 2 Rods ( + & – ) times the additional 2 each x as many you wants to speed up the electrolyses to get more Fuels per Time. o	Volts to each Rod with coils = 12 volts minimum each rods (+) & (-). o	Volts supplies Needed to High speed the Electrolyses to take Fuels/Unit of time = 220 volts UP per Rods (Stainless or Silver Stainless) = 220v ++ to Each (+) and (-). o	Used as Many (+) & (-) Rods you will need to get more volumes of Fuels per time. + Need More Power for Additional (+) &(-) Rods with Coils. •	Connections from Power Supply from your Generator to the 2 or More Rods to Generate Fuels (Hydrogen & Oxygen Gas), Redirect Fuels 2x = H2 & O Gas to Direct Go to Your Piston Engines or other Engines.. To Run your Turbines in your Generator or other Used of 2 fuels – Hydrogen + Oxygen Gas. •	2 or More (+) &(-) Rods direct Contact With Depth To Salt Water to Electrolyses to Generated Gas Fuel, But not The Coils from Rods. –	You just can Direct Input/inject the 2 Gas fuels (hydrogen and oxygen) to your Engines in Power Plants or to your heater Burner in your Heater Machines . o	Cleaning and Supply of salt water or direct sea waters to used to take Fuels Sources. You Can Take Hydrogen Gas Fuels as Many as much more you can supply Your Power Plants or Factories that Needs Fuels. With No Cost of Fuels to Used at All Times. Thank you Mr. Millares for your nice information. We think it would be best you send a formal project proposal to the Governor. Hello, I would like to ask if you have this economic development plan after that devastating earthquake? I am currently taking up my MBA, and I’ve chosen Bohol as the topic of my study. Hope to hear more from you. God bless. The Provincial Government of Bohol has formulated a Rehabilitation Plan which you can download from the link below. We hope this can help for your purpose and for the good of the Boholano people. Thank you Sir Willy Bueno. This will really help me a lot. I’m hoping for the fast recovery of your province. God bless you and all the Boholanos. hi sir, im an architecture student having a proposal of specialized medical institution for renal health, my data gathering from offices such as DOH,NKTI-redcop and articles from the net stated that the province/ region could be a good site, my question is how can i have a copy of Comprehensive land use plan and copy of the tct thanks. If you are referring to the CLUP of the Municipalities, you may contact the concerned municipalities. If you are referring to the Provincial Development and Physical Framework Plan (PDPFP), you may download the 4 volumes of the PDPFP from the link below. We’re sorry we don’t have any idea of what TCT is. Just please elaborate. Thank you. Firstly, I would like to thank you and your comprehensive website for providing almost all the details I needed for my academic requirements. I am currently pursuing my masters degree and in one of my core subjects, I was tasked to evaluate sustainable development outcomes of the Province of Bohol after the Great Bohol Earthquake in 2013. With this, I am planning to look at the different strategies the Province employed in ensuring sustainable environment after the earthquake. Aside from the Post-Great Bohol Earthquake Rehabilitation Plan, do you have other documents that I might be able to use on this endeavor? May I also humbly request your office a copy of your FY 2014 Annual Report and the updated PDRRM plan for my reference. We just uploaded the Annual Report 2014. With regards to the PDRRM, we don’t have an update yet. Another plan, the Provincial Development and Physical Framework Plan (PDPFP) is yet to be updated later this year. The update will highlight the inclusion on DRR-CCA resilience strategies. We hope these documents can help for your purpose. Thank you. Thank you for the immediate response. You’ve been very helpful. I hope all LGU websites are as responsive and comprehensive as yours. We’re not sure what SWMP stands for. We assumed it’s about Solid Waste Management Plan and forwarded your query to the Bohol Environment Management Office (BEMO). You may also contact them at bemophil2@gmail.com. Ms. Myra Trinidad is in-charged on Solid Waste. We hope we’re of help for your purpose and for the betterment of the Province of Bohol. Thank you. 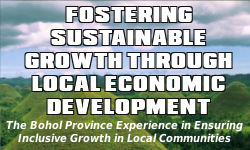 In connection with Bohol’s Provincial Development & Physical Framework Plan, since this has a macro coverage for the whole province, I would like to inquire if Bohol has the same Development & Physical Framework Plan in a micro coverage. I am looking for development plans per municipality. Kindly advise. The PDPFP is a Provincial Development Framework. If you wish to find an equivalent document for the municipalities, you might want to look at each municipality’s Comprehensive Land Use Plan (CLUP). Contact the respective Municipal Planning and Development Coordinators for such documents. Thank you very much for providing online access to these plans- very helpful especially to students, planning officers and development workers. I would just like to ask, sir, where can we find / how can we get a copy of the Bohol Tourism Recovery Plan (BTRP) / Tourism Recovery Roadmap? According to the sector in-charge, we do not have a copy of such documents We would like to refer you to the Bohol Tourism Office perhaps they have such document. Thank you. I was wondering if your office (or any related office) has a CLUP of the proposed reclaimed area that was mapped in the Tagbilaran Environmental Profile and if we could have a copy as it will be used in out thesis proposal.